Tom has worked in international affairs for most of his career and travels regularly to remote parts of Africa, the Middle East, and South Asia. He also rides a dual sport motorcycle, often solo, on backcountry and forest roads. He has been in the habit of packing a survival kit for years, but what to include has always been based just on prior experience and books. Tom wanted insights from a professional, and when he saw the Wild Comforts offering, he thought it would be a fun and educational experience for the whole family. Why did you choose Mountain Shepherd? Mountain Shepherd came up on a Google search of survival training. It is within driving distance of our home, and the backgrounds of the trainers and description of the classes conveyed a sense of professionalism and real experience. 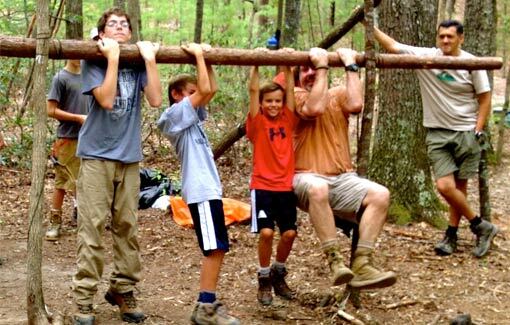 Before you went, what did you think survival training would be like? Kathy, Grace, and Claire thought the training would be less interesting than it was, but they are good sports and knew that their Dad would enjoy it. How did your experience surprise you? Kathy, Grace, and Claire were surprised by how much fun it was. Tom was pleased to validate some of his current practices and equipment, and also to learn many new techniques and skills. Mountain Shepherd’s very logical explanation of priorities and the rationale behind them was excellent. Tom’s favorite part was seeing his daughters learning skills and embracing the challenge of setting up their own shelter and sleeping comfortably in it through a rainy night Tom also has revamped his med kit based on the training and would like to go back for the survival medical course. We’d recommend the Wild Comforts course for families. Very practical and accessible information and hands on training in a beautiful outdoor environment. In general, anyone who likes to get away from it all – whether on foot, bicycle, 4×4 adventures, motorcycle, or canoe/kayak – should invest the time in a basic course like this. Having a fanny-pack sized kit of equipment AND the knowledge of what to do with it can dramatically mitigate the danger and fear of being stranded or lost. What advice would you give to others who are about to take a survival training course? (a) Select the course and school carefully if you don’t want a lot of end-of-the-world scenario and macho baggage with your training. Also, don’t confuse survival training with a course of primitive living practices. (b) Leave your ego at home and have an open mind. There are hundreds of different ways to do things, and the best approach is often situation specific. Good trainers will help you understand the general principles behind the specific choices they make (Reggie Bennett of Mountain Shepherd is gifted in this regard). (c) Don’t worry about whether you are in “good enough shape” for a course – you are not trying out for a SEAL team, you are learning skills needed to save the sorry old body you have in an emergency situation! (d) Bring your own gear if you already have some and use it – this is a great opportunity to see if that knife/fire starter/ tinder / signal mirror/ compass etc. you lug around is best, and to compare it to what professionals who test equipment for a living choose to use. General review: 5-stars out of 5. Would recommend highly for content, delivery, atmosphere, and overall experience!